Happiness is a hot pierogi: Peyton Hillis - A Footnote in the Cleveland Sports Fail Reel? 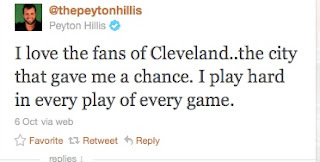 Peyton Hillis - A Footnote in the Cleveland Sports Fail Reel? Being a Cleveland fan continues to be painful. 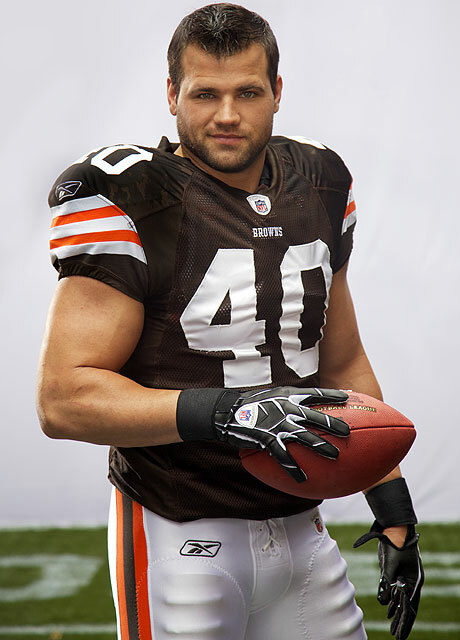 Right now, my biggest fear (besides of course Bobby Flay attacking me with an army of hairy spiders), is that Peyton Hillis is going to become a footnote or passing blurb in the latest edition of the Cleveland Sports fail reel. Last season, fans were overjoyed to take a chance on Hillis. The trade with the Broncos seemed like finding a priceless work of art for a dollar at a garage sale. in 2010, Hillis became the first Browns player to be AFC Offensive Player of the Week since Eric Metcalf, almost 20 years ago. And let's agree how fitting it was that he was selected as the cover for Madden 12...over Michael Vick. 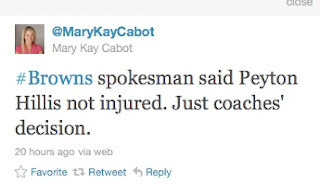 Hero of the Dawg Pound over the Dog killer. Good against evil. You name it, we as fans ran with it. 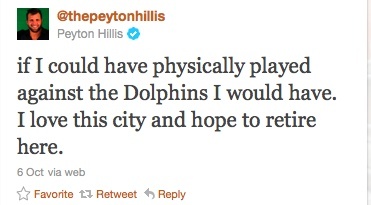 I don't know Hillis personally. All I know of him is that he tweeted me that he would sign my football. But, he strikes me as the "aww shucks, ma'am" kind of guy. I haven't heard wild stories of him at strip clubs or getting loaded and tearing up bars. He isn't getting in fights or cussing fans out. I'll bet he has a gun, but I would go on a limb and say it is for hunting only...during season of course. If he spends his money on anything it is a new shiny pick up truck. Point is, he is a hard working guy that wants to play. Remember folks, this is the same guy that during the off season harnessed himself to a half ton pick up truck and dragged it through his neighborhood. 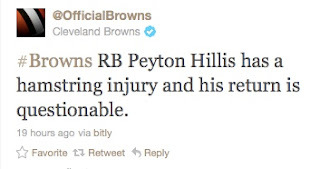 Word started to leak that Hillis and the Browns were having trouble coming to an agreement on his contract. And then Hillis got sick. Word around the water cooler was that he had strep throat. He was sent home from practice by the team. He lost 12 pounds. Then, he was too sick to play with the team against Miami. his agent claimed that he told Hillis to stay home. That my friends is where things began to explode into a slimy mess of confusion. 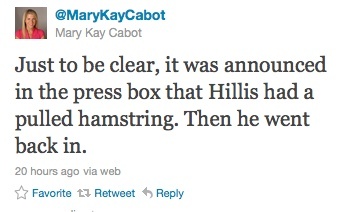 Did Hillis' agent tell him to stay home because he was sick or he was "sick?" Was Hillis on his sickbed wishing his mommy would bring him some soup or was he chillin' in his jammies watching sportscenter with a teeny weeny sniffle? Hillis is on his third agent in a year. I would humbly suggest he look for a fourth. This controversy brewed up during the bye week, which meant it was dissected and poked and prodded and speculated within a hair of its life. Cleveland talk radio and the interwebz were burning up with angry armchair callers, furious bloggers and don't even get me going on the tweeters. Josh Cribbs tried to douse the flames of sports fail rage with a call to a local sports station. He believed that Hillis was sick and leave the man alone. I think Hillis was sick and couldn't play. If he did, he could have gotten hurt or dear lord, spread his cooties to the rest of the team. Whew. Controversy over. Let's play ball and win some games people. That is of course, a dream that I have. Sadly, Coach Shurmur may have something else in mind. For some reason known only to the Coach, Hillis barely touched the ball since sitting out the Miami game. 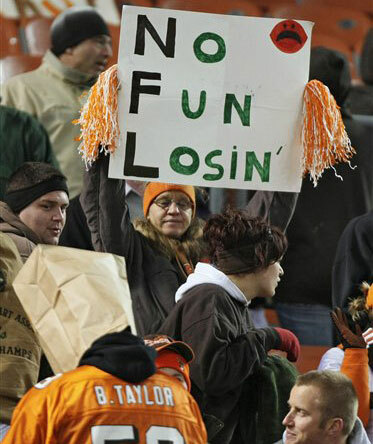 This of course caused Browns fans to lose their collective marbles. In the Raiders game, Coach called plays for Montario "bricks for hands" Hardesty. OK, that was a little harsh, but when the guy was clearly having a tough time, get him out and send Hillis in. Hillis was seen trying to convince the RB coach on the sidelines (watch before the NFL yoinks it), but nothing. Fans continued to scream and throw nachos at their television sets. 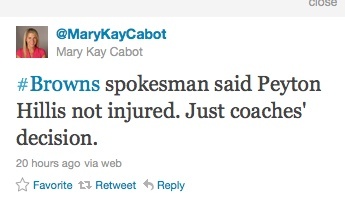 In the third quarter, the Browns said Hillis was not in because of the coaches. More nachos hit the flat screens. Then the Browns told everyone that Hillis was injured. The Coach would later say it was in very early in the game, the first or second quarter. A collective barrage of curses cut through the air as Browns fans everywhere were out of nachos to throw at the screen. How can we lose Hillis? It was at this point I was screaming in the middle of the living room with my arms flailing about. If Shurmur is trying to show Hillis and his agent who's the boss, yes we get it. You sir, are bossy Angela to Hillis' Tony. Got it. I think I speak for everyone when I say, we all got it. We understand. You proved your point. Can we just play ball now? Please?